So we started Peanut on solids. We decided to go with Squash (we gave him butternut) because I read it was one of the best food for babies to start out with. 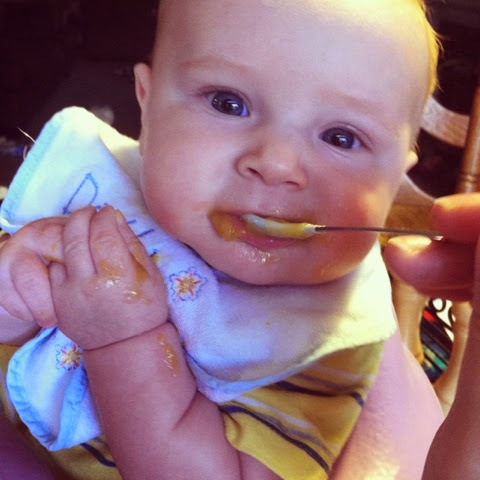 And this video is from after I made some homemade yellow squash baby food which he loved even more! 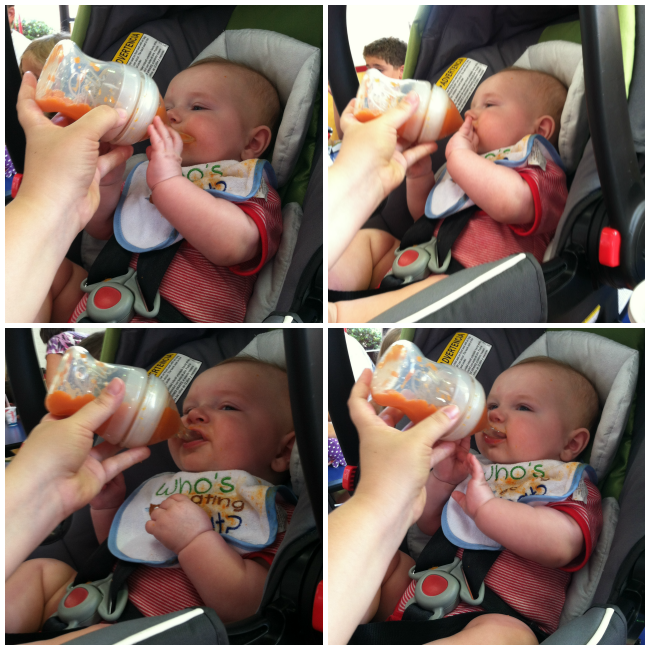 He has also tried applesauce which he isn't really a fan of (of course it was jar food) and carrots (which he LOVES). I've been using the baby food recipes that came with my Cook-n-Blend baby food maker. So since I am a Nuby Mommy Blogger, I get sent some amazing products to review occasionally. And I was sent a SoftFlex™ Infafeeder™ to test out. I thought it would be great for when we went out to eat because it was designed so you squeeze the right amount of baby food onto the spoon. What I think is a very neat feature, if you own the Store n’ Feed™ Breastmilk Storage Containers the lids can be used for the Infafeeder as well. This helps to tote homemade baby food around in the diaper bag. It kind of looks like a bottle, but they eat from it as they would a spoon. The Nuby SoftFlex™ Infafeeder™ is available for purchase at Khols.com, Kmart, or Ross! I think we are going to start him on Avocado or Sweet Potatoes this week. I haven't quite decided yet! What were some of the first foods you fed your little one? What do you think of the Infafeeder? I received products mentioned above complimentary for the purposes for review. I received no additional compensation. All opinions are my own. He looks so adorable!! I love that Nuby SoftFlex Infafeeder! I had never even heard of it before now but it looks really neat! Thanks for sharing!